Most of us at some point in our lives have heard of the tale of Aladdin and the genie. Alas, we never thought it could come true for us until now. Thanks to the development team at Pragmatic Play you get a taste of what it would be like to have your own genie! Enter this realm of eastern promise and try your hand at 3 Genie Wishes to see what treasures you can unearth. 3 Genie Wishes is a 5-reel, 50 fixed pay line slot offering an amazing 96.53% RTP, for all who dare to enter the genie’s cave. Characters from the tale all make a welcome return to the reels including Aladdin, the princess, the evil wizard, monkey and parrot. Alongside them are your card symbols all making your lower value symbols for the duration of the game. A backdrop of an ancient city lies behind and there is a very relaxing soundtrack playing along, which gives a realistic feel to the theme. 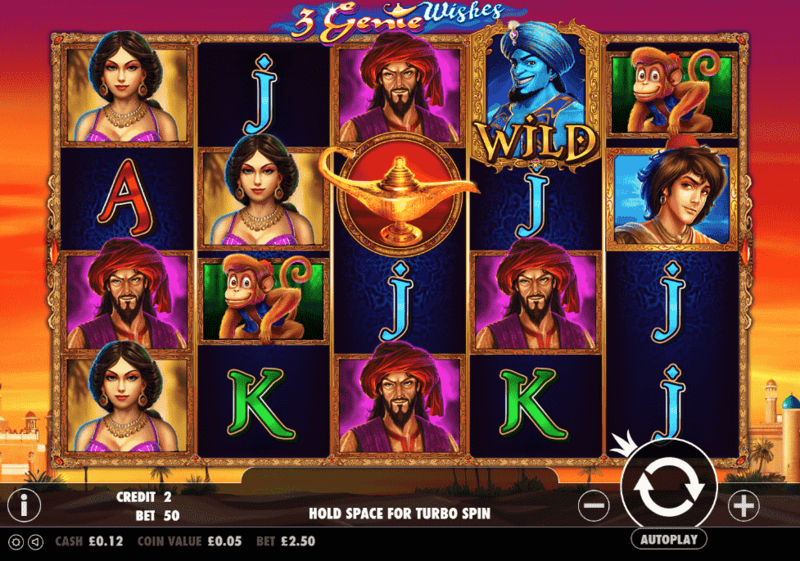 Bet Amounts – Betting on 3 Genie Wishes begins at 50p per spin and can be increased to the maximum of £250 per spin. To amend those all-important bets, you need to click on the plus or minus signs on either side of the spin button. You will then see the option to change the coin level and coin amount, meaning you can play around until you reach your desired stake. Wild Symbol – Of course in a game called 3 Genie Wishes the wild has to be a big blue genie, what else? He will substitute for all other symbols except the scatter and is the highest paying symbol in the game. Pay-outs vary depending upon your bet amount but landing 5 of these symbols on a winning line will give you between a £4 win up to a £2,500 win. Be sure to check out the pay table after you amend each bet to check out the win amounts as they change. Scatter Symbol – As the genie is the wild it makes sense that the scatter symbol is the lamp from whence the genie came! Land yourself three of these on reels 1, 3 and 5 to trigger the bonus game. Landing x3 symbols on 3 Genie Wishes will also award a scatter win, on top of your line win of x1 your total bet amount. Bonus Spins Feature – Once you have landed three lamp scatter symbols on reels 1, 3 and 5 you will enter the bonus round. On the next screen you will be given the choice of three objects and each one has a different aspect to add to the round. Bonus spins – allocates 10 spins with raining wilds or 6 spins with sticky wilds. During the bonus round the scatter symbol is removed, so you will not be able to retrigger the spins again unless it is from within the main game. If you enter the bonus spins section of this round you will be allocated a set amount of spins and one of two very special features which are explained below. You will receive one or the other of these features, not both and they are selected at random so you never know which will be triggered. Raining Wilds Feature – Should you enter the bonus spins round, then you may be fortune enough to enjoy the raining wilds feature. Here you will be awarded random wilds upon each spin. The wild will only remain in place for that spin, because new wilds will be added on the next one and so on until the round ends. Sticky Wilds Feature – Again only available within the 3 Genies Wishes bonus round, this one is slightly different. Upon the beginning of every spin new random wilds will be added to the reels, they will then remain there until the round ends. This means that the reels will slowly begin to fill with wilds after each spin, making potentially bigger wins each time. Well, we certainly had some of our wishes answered here how about you? 3 Genies Wishes is quite an exciting game albeit a simple one at its core. 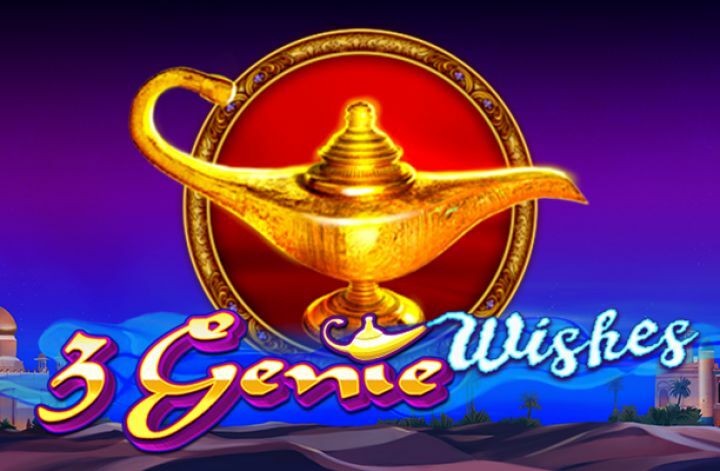 Although there is only one feature it has a neat little twist to it with the three ‘wishes’ given by the genie to boost those winnings or spins. We certainly feel that Pragmatic Play have created a long-lasting enjoyable game and we think you will agree. Now off you go, get rubbing that lamp and see what the genie has in store for you!